Install Phoronix Test Suite and benchmark your system's graphical performance using the Unigine benchmarks and Steam games. This guide targets Debian, Ubuntu, Fedora, OpenSUSE, and Arch Linux. A working install of one of the supported distributions with root privileges and the latest graphics drivers installed. Head over to the Phoronix Test Suite download page, and grab the latest .deb package. When you have the package, install it with dpkg. Optionally, install Steam. If you're on Debian, enable the non-free repos first. Phoronix Test Suite is available in your repositories. Install it. Next, enable the RPMFusion repository on your system, if you haven't already. Then, you can install Steam. Both packages are already available in your repositories. Install them. The Phoronix Test Suite is available through the AUR. Head to its page, and install it. When you have PTS, install Steam with Pacman. You can start up Phoronix Test Suite either as in interactive command line utility or through single command. First, take a look at the interactive utility to give yourself an idea of what it can do. The easiest way to do that is with the graphical launcher provided by the installation. You'll see some information about your system and the available options. Test it out by listing the available tests. Back out of there now. There's another way to list out the tests too. Open a new terminal and run the following command. 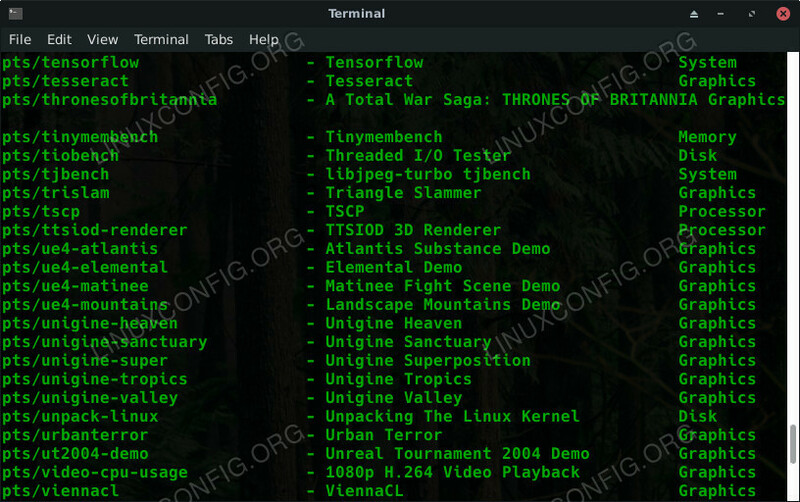 You'll see a huge list of tests fill your terminal window. The names of the tests following pts/ or system/ are what you'll be working with. Start by running a great general purpose graphics benchmark. The Unigine tests are excellent for this. Install Unigine Heaven through PTS. You can always install a test by running it too. 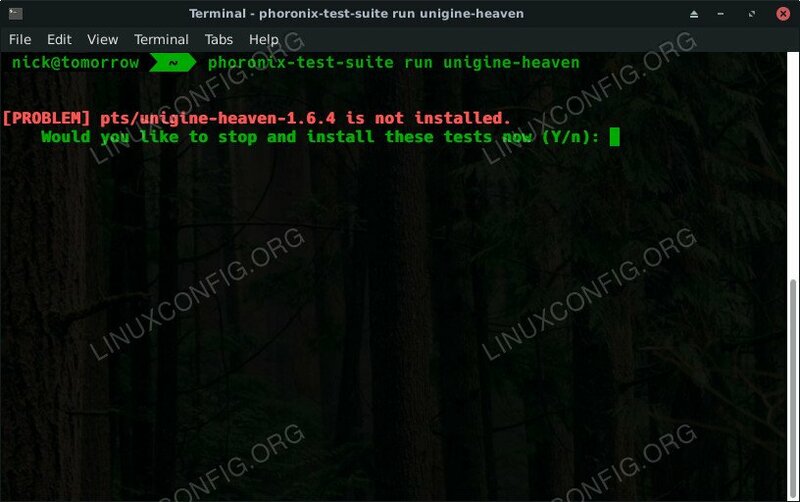 If the test isn't available when you go to run it, Phoronix Test Suite will prompt you to install. After you have the test, you can run it. You'll be prompted to set some options before the test. In this case, you'll be asked the resolution and the graphics library. The test will start up and run through a rendered 3d environment. PTS scripts it to run through and conduct the test three times. It will then average the framerates from the three tests together to give you your final result. Phoronix Test Suite also includes options to test with Steam games. The process is smoother if you already have the game installed, so open up Steam and sign in to your account. Pick a game that you want to test with. You can list out the Phoronix tests, or you can pick something like DoTA 2 that's free to play for now. This guide follows Metro Last Light, but you can use any game that PTS has a script for. Once your game is installed on Steam, leave Steam open, and install the test with PTS. 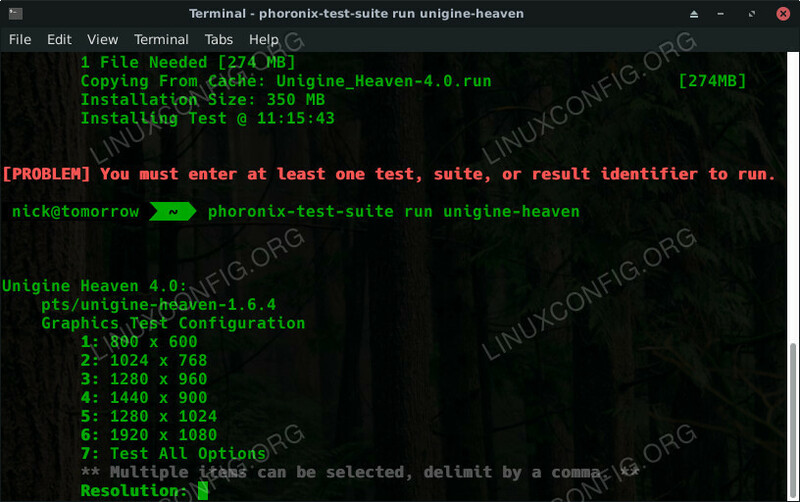 Just like the Unigine test, Phoronix Test Suite will ask you some questions about how you want to run the test. Then, it'll kick off running through a few times. It'll present you with the results when the testing is complete. You're now ready to measure the performance of your system for graphical tasks. You can test out new driver versions, and other things like kernels that may impact your framerates. Phoronix Test Suite is also capable of testing a lot of other things on your system. Feel free to have a look around and try out some additional benchmarks. It can help you find weak points in your system that may need an upgrade or improperly configured software.